Once you have decided what type of Notebook you want to create, you can create the type of notebook you need within the “All Notebooks” panel. In the video above, the user double-clicks on the notebook name to go into edit mode so that the Notebook name can be changed. Double-clicking Notebook and Note name to go into edit mode works on both desktop and mobile devices. The new Notebook will automatically show up within the “Selected Notebook” panel when it is created. 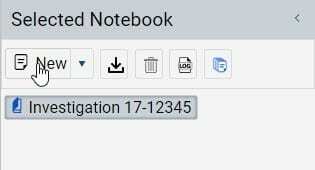 A new note within the Notebook can now be created by clicking the “New” button. A new non-timestamped note will then be created. The advanced editor has many features including an auto-save feature to ensure you do not lose your notes. The editor will display the last time a note was saved in the lower right corner. For information on how to complete the above tasks and many more, refer to our Editor FAQ page. When you are ready to Timestamp your note, click the “Timestamp” button below the editor. Generating a Forensic Note is like carving your note in solid granite. 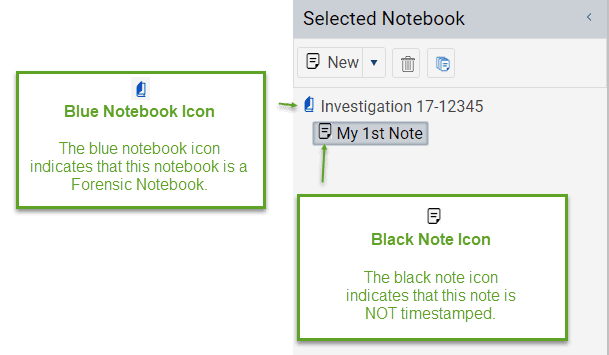 Once you generate a Forensic Note, you will not be able to change that note. Editable copies of your Forensic Note can be created but the original Forensic Note will remain un-altered. If you are interested in the technical details of timestamping a note, please refer to our detailed article “Timestamping Authority (TSA)“. To edit a note, click the “Edit Note” button as shown below. As shown in the above video, you do not have to re-timestamp the new note until you are ready. Editing a Forensic Note – Actually You are Creating a Copy to Edit! Each time you edit a timestamped note (Forensic Note), you create a copy of the original and edit the new copy. The original Forensic Note (Timestamped Note) remains un-altered. Although you can change the date and time of the note entry, this does not affect the actual timestamp which can be used to show when you saved the note. As a result, editing Forensic Notes should only occur to correct minor mistakes such as spelling, grammar or to further clarify existing information. Attempting to change a notes original meaning or removing information you no longer want disclosed can be discovered by the opposing party. This is because the original note will be part of the Forensic Notebook you download for legal disclosure. Instead of removing information, you should instead Redact the information as you normally would. Forensic Notes increases your credibility because you can prove that you are providing all information you have related to an incident. As shown in the image above, you can view All Timestamped Notes (Forensic Notes) by clicking on the icon indicated which will result in the following view. As you can see above, the original Timestamped note (Forensic Note) is still visible and available for download. All versions of a Forensic Note will be displayed in this view with each version clearly identified. When you download a Forensic Notebook, it will include all previous versions of Forensic Notes to provide full disclosure.